The newspaper claims US climate scientists 'manipulated global warming data' to encourage a climate deal. But did they? This past weekend the Mail on Sunday said it uncovered a gigantic scandal of misbehavior by US climate scientists. Climate skeptic reporter David Rose claimed he obtained evidence that the US National Oceanic and Atmospheric Administration (NOAA) rushed out a report with “manipulated global warming data” in order to convince world leaders to agree a deal to tackle climate change. One of the key charges in the Mail piece is that this ‘flawed’ NOAA study shows higher temperatures than its ‘verified’ equivalent from the UK Met Office. But, as NASA scientist Gavin Schmidt points out, the graph illustrating this discrepancy was wrong. The NOAA study showed temperature change compared to the average between 1901 and 2000. The Met Office used on the 1961-1990 average. Because the Met Office data is more recent the change is smaller, it looks like temperatures have risen by less. Once that mistake is fixed, the graphs show pretty much the same thing — and the warming trend is clear. The Mail has since updated the graph online. That’s Berkeley climate scientist Zeke Hausfather, writing for Carbon Brief. He explained the study showed more global warming simply because the agency had started drawing upon data from vastly more temperature-measuring stations. Before we negotiated a single word in Paris, 188 countries had put forward pledges for the meeting. You’re going to tell me what got all of them to go through those discussions was based on one NOAA study? Hausfather adds that routine revisions to the data will show 10% less warming over the past 15 years than the NOAA study originally did. It’s important to note though that even that will still represent a 50% increase from the agency’s older studies. For more on the science, check out these blogs from Variable Variability and Icarus. 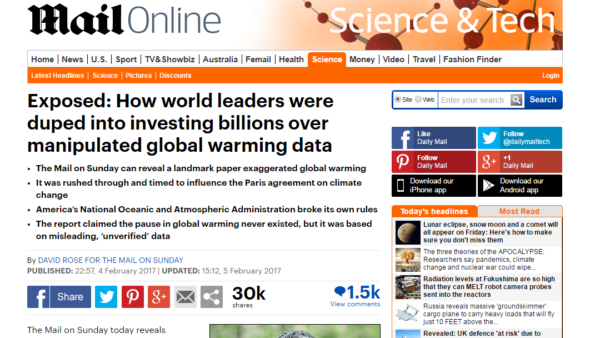 The Mail claims the NOAA study was “rushed to publication” in order to back President Obama’s push for a climate deal at the UN climate summit in Paris later that year. The journal Science, which published it, doesn’t agree with that, pointing out that it was reviewed for 6 months, which is actually longer than your average scientific paper. In a statement to Carbon Brief, editor-in-chief Jeremy Berg took issue with that characterisation, calling it “baseless and without merit”. So, did diplomats change their minds after reading this sensational new study? Not according to Climate Home. Of the 10 climate envoys they contacted, not one said the study made a difference, with some observing that the body of evidence supporting climate change extended well beyond one NOAA report. The Mail’s scoop was based on evidence from ex-NOAA scientist John Bates. The only problem? They totally misrepresent what he said. “The issue here is not an issue of tampering with data,” he said the day after the Mail story was published. Instead, his criticism concerned NOAA protocol — he disagreed with the archiving method used by his colleagues. Since Dr Bates was really talking about NOAA protocol, and not some bogus spiel about doctored climate data, let’s look at that. Basically Bates had concerns about the way data was handled, documented and stored. According to an one report, it was essentially an engineers vs scientists dispute, with Bates arguing that the methods used by the satellite data collecting team should be replicated by the surface data collecting team. But Bates’ satellites use software that’s impossible to tweak once it’s in the air — and so it undergoes time-intensive testing before launch. Data accumulated from weather stations on the ground, however, is more straightforward — it’s far easier to spot and fix mistakes. Which is what they did. The other scientists appear to have disagreed. To be honest it gets more complex, far too complex for Mr Rose and his particular message. Perhaps it wasn’t the timing of the study that was suspicious, but the timing of the criticism. The Mail piece was published just two weeks after Donald Trump ascended to the presidency on an anti-climate action platform. It also came just days before the Republican-controlled House Science Committee began its hearing into the Environmental Protection Agency. The ‘Make the EPA Great Again’ push appears to be a barely-disguised attempt to gut funding for climate science research in the US. And it got the headline it wanted.